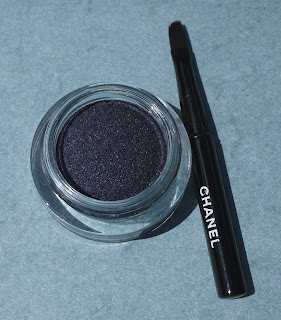 I was disappointed when I found Apparition, Chanel's limited-edition, gorgeous deep blue Long Wear Luminous Eye Shadow ($36) sold out at Chanel.com. While talking with Lizette Settepani, Chanel's regional representative in my area, I told her how much I had wanted it. She said it has sold out within a day just about everywhere. Then she found me one! I was thrilled. Apparition did not disappoint. It's a gorgeous color - much prettier than it looks in the pot. It's shown at the top of this feature in Chanel's photo and directly above in mine. The little applicator that is shown with it comes in the box. The applicator has an edge that allows you to apply the shadow as a liner, and it has a flat surface that's great for on-the-go shadow application. A new vision of elegance – an intense grey-blue shade offers chic shimmer with long-lasting versatility. The innovative gel texture, presented with a specially designed brush, can be worn as eye shadow or eyeliner. Part of the limited-edition Blue Illusion de Chanel Collection. Now that I've worn Apparition, I'm even more excited to have one. Here is another description, offered for an earlier collection, by Chanel. Make sure to keep the cap on these shadows tightly in place. They will dry out if you don't. I will for sure. I don't want to lose this beauty. I took swatch photos in full, morning sun. Look at the color! I think it's one of the prettiest blues I have - primarily because it's so touched with grey. It's a subdued blue, not one of those in-your-face blues that make me look like a peacock. 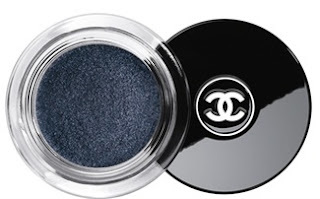 It's an elegant blue, a Chanel blue. The shimmer gives it life and makes it eye-catching. If you want one, you may have to jump through hoops. I got my help from a Chanel regional guru. If anyone could find it, Lizette could. If I were still looking, I'd call the Chanel boutiques first. Then, I would start calling every Chanel counter I could, asking each Chanel representative to check the store's online inventory. Someone must still have one! This is such a gorgeous color. I have to have it! My Nordstrom says this doesn't launch until end of October - beginning of November. They'll be getting some in then so I'm not out of luck! Thanks for the great review CG! Ooh - thanks Jo! I want this too - great to know it will be available again! I got mine a month ago since I live in Germany and I have to say that I was very disappointed with the formula. I usually love Illusion D'ombre and I own each of them but this one didn't stay put, plus it creased on my lids. I have never had an illusion d'ombre before which creased. But I love the color, since it also leans a bit purple it goes good with each skin color/ eye color combination. This is why I have mixed feelings about mine. Wow, make sure you are "on the list." I wonder why they will get it so much later than the Chanel boutiques - and Neiman Marcus. It's it nice I have such informed readers? Oh no, Sarah, that's to bad. I haven't had that problem, and I don't see any purple. BUT, how color turns out is always dependent on our own skin tones. Great for a night out, I think. Enjoy! I was also thinking that is really blue until I compared it with Armani ETK #1 and some of the limited addition ones of this summer ( I believe they are #20, 21 etc.) and they are way more blue :-) Anyway I love a bit of red in blue and probably as you pointed out my skin tone (NC25 yellowish) emphasizes the red in that one. Interesting because I also have destination ( grayish blue) and that one builds up much better, I only have issues with Apparition.